If there ever was a definition of “A-list”, it most certainly arrives in the form of Tom Cruise. This is an actor who has been on our screens in some of the biggest movies ever created. 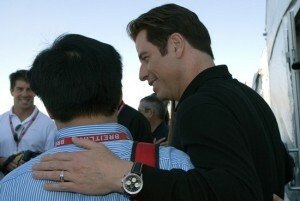 He regularly wears a Bremont model, with the British watchmaker renowned as being somewhat more rugged than some of the other brands that are discussed through the remainder of this article. On the subject of A-list actors, step in Leonardo DiCaprio. 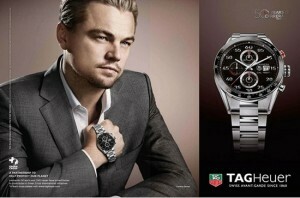 It’s on this occasion that one of the more well-known watch manufacturers steps in, with Tag Heuer being the lucky brand that has enticed DiCaprio. 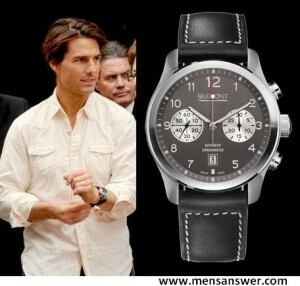 It’s the Carrera Chronograph which he specifically wears and again, at least in comparison to some of the models that the celebrities wear, the cost of this is modest. 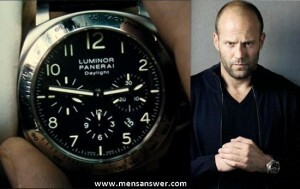 Jason Statham has turned to Panerai as the watch brand of his choice and if you have watched one of his films, The Transporters’, you’ll see that his character dons one of these models and it is prominently featured. Having sold tens of millions of albums over the course of his career, few would doubt that he is one of the biggest personalities in music, while he has also crossed into the acting industry over the years. This is where the world-famous Rolex brand comes into play, with the singer now donning a Rolex Milgauss. Such an association really shouldn’t come as a surprise, particularly when you see that Forbes recently classed this company as the 57th most powerful global brand in the world. It is arguably the most exclusive brand in the watch industry and one has to wonder if this will ever change. 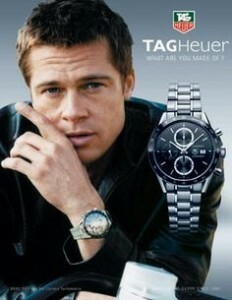 Tag Heuer is the brand that appears on his wrist, with Pitt currently being one of the company’s ambassadors. At the moment he wears the Carrera model, which happens to be one of the most popular types due to its elegant appearance. Whether it is the Iron Man series or Sherlock Holmes, Robert Downey, Jr is now one of Hollywood’s favourite actors. He has been specifically spotted wearing the Amvox 3 model, although this isn’t merely what the manufacturer is renowned for. They have invented the world’s smallest calibre and the world’s most complicated wristwatch, meaning that they are another of the most exclusive brands in the industry. John Travolta, who is best known for his lead appearances in the likes of Pulp Fiction and Face-Off. 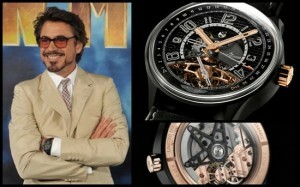 Just like Downey, Jr, he also boasts a career spanning decades and this is probably the reason why there is particular interest placed in his watch. 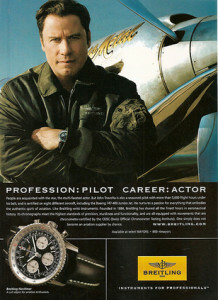 An avid pilot, Travolta has been a spokesman for Breitling aviation watches for many years. If the person’s watch preference is due to an ad campaign and cash it is not the same thing as making a choice.